Thanks, Anastasia. Being New Year’s Eve, I doubt we have many people dropping by Killer Crafts & Crafty Killers today. You’d be surprised how many people would rather spend a few minutes with me rather than get all dressed up and party the night away. Besides, be honest. When was the last time you really enjoyed yourself going out on New Year’s Eve? All that noise. The crowds. And the food is usually sub-standard, even at the best restaurants. Of course, I do. It’s much more relaxing to curl up with a good book -- or in this case, a good blog. Light a fire in the fireplace; make some hot chocolate. What could be better? It’s not like either of us would traipse into the city to freeze our buns off for hours with a million tourists as they wait for that crystal ball to drop. 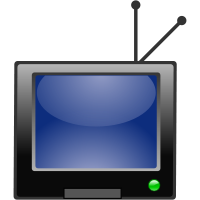 You get a better view on TV. Plus, we’ve got bathroom facilities. They don’t. True. I always wondered how they all held it in so long. Especially in the cold. So how about we give our readers another look into my crazy family? I think it’s time to introduce my multi-married Mama. Great idea! From last week’s excerpt, I’m sure it became apparent that Mama and Lucille, my mother-in-law, don’t exactly see eye-to-eye. Lucille is the president of the Greater New York area chapter of The Daughters of the October Revolution. Mama, a life-long member and past social secretary of the Daughters of the American Revolution, is convinced my mother-in-law is plotting to overthrow the government. Considering the total membership of The Daughters of the October Revolution consisted of thirteen semi-crippled female octogenarians, I find the threat negligible. Mama believes otherwise. Flora Sudberry Periwinkle Ramirez Scoffield Goldberg O’Keefe had a knack for losing husbands. With Seamus gone, she was fast approaching Liz Taylor territory. In truth, Mama didn’t lose them so much as they wound up dying on her in a succession of odd circumstances. My own father had drowned while scuba diving in the Yucatan on their twenty-fifth anniversary. A year and a half later, Mama remarried. Husband Number Two, an adventure-seeking daredevil, lasted four months before the bulls gored him to death as he raced through the streets of Pamplona. Number Three made it to their first anniversary. Barely. Highly allergic to shellfish and having forgotten to bring along his epinephrine, he asphyxiated after inhaling the aroma from a sizzling platter of shrimp that a waiter carried past their table. Number Four lost his footing at the Grand Canyon and plunged to his death during their honeymoon. So now Mama was once again widowed. A temporary situation. Mama was the kind of woman who needed a man. And whenever Mama was between husbands, she came to stay with us. 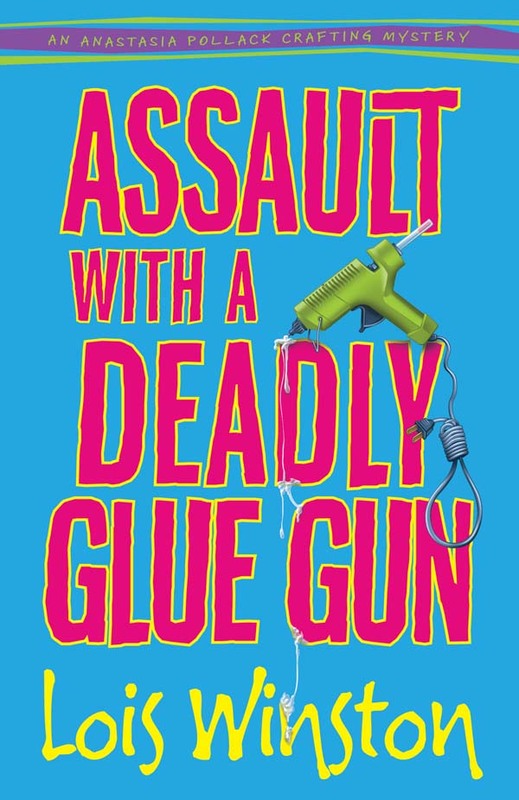 If you want to read more about Mama, Lucille, and the rest of the motley crew that live within the pages of ASSAULT WITH A DEADLY GLUE GUN, the wait is over. Booksellers across the country should be placing them on store shelves as you read this, if they haven’t already. Amazon and other cyber-bookstores have had the book available for several weeks. In addition, I’m also giving away a collection of crafts books at several of the blogs, including this one. Post a comment here today to be entered in the drawing. The winner will be posted Sunday, so be sure to check back to see if you’ve won. Thanks for having me here today, Anastasia. And Happy New Year, everyone! Thanks, Anastasia. When I take a plane trip, I always used to grab one of those complementary little pillows as soon as I entered the cabin. They can be back-savers, especially on long trips. However, most airlines are no longer offering this fluffy little perk. My first tip today is to pack a small pillow in your carry-on. Place it between your lower back and the seat, and you’ll find your flight far more comfortable, no matter how packed the plane. This works for train trips as well. And don’t cross your legs! (Not that most planes give you enough leg room to do so nowadays.) When you cross your legs, you put stress on your pelvis and hips. This contributes to lower back pain. Another tip -- make sure you walk or stand every two hours to keep your blood circulating and prevent blood clots from forming in your legs. This is extremely important the longer your flight. If you’re traveling by car, stop every couple of hours to stretch and walk around. It’s also not a bad idea to do a bit of stretching and/or walking prior to starting your car journey. Be prepared. No matter how you travel, make sure you pack everything you need. I keep a list of must-haves on my smart phone. Before I take any trip, I check the list against what I’ve packed, making sure I’ve remembered such essentials as prescription meds, sunscreen, hair care products, all necessary clothing (underwear, pj’s, etc. ), and emergency items such as band-aids, aspirin, etc. Thanks, Serena. I won’t be traveling anywhere any time soon, but these are great tips for our readers who do. When I did travel, I usually forgot one essential item each trip. Thanks, Anastasia! For those of you hooked on HGTV, you probably drool over stainless steel appliances, granite countertops, and solid cherry cabinets while you stare glumly at your old appliances, chipped Formica countertops, and laminate cabinets. Even if you can’t afford the stainless and the granite and the cherry, there are ways to spruce up a tired kitchen for very little money. For the cost of a can of primer and a can of paint, you can give your cabinets new life. The secret is knowing how to prep the surfaces properly. Home improvement centers offer classes. Invest a few hours in learning how to do the job right before tackling the project at home, and you’ll be ecstatic with the results. Don’t stop with the cabinets. Consider painting your kitchen table and chairs. Then add new seat cushions. Upholstered kitchen chair seats are simple to reupholster. All you have to do is unscrew the seats from the bottom of the chairs. The fabric is merely stapled in place. Remove the staples, and use the old fabric as a pattern to cut new fabric. Staple on the new fabric, then screw the seats back in place. Ta-da! You’ll have a brand new looking table and chairs. Buy a little extra fabric, and make matching valances and/or curtains for your kitchen windows. If you can afford to put a few extra dollars into your make-over, consider replacing the handles and drawer pulls on your cabinets and updating the lighting. Finally, consider tiling your worn Formica countertops. If you have your heart set on granite, but your wallet won’t cooperate, consider granite tiles as an alternative. Once again, you can get how-to’s and advice at your local home center. Combine all ingredients. Cover and chill at least 2 hours. Serve with crudités, crackers, pita chips, and/or a thinly sliced baguette. CRAFTS WITH ANASTASIA--DON’T THROW AWAY THOSE SCRAPS OF FABRICS! 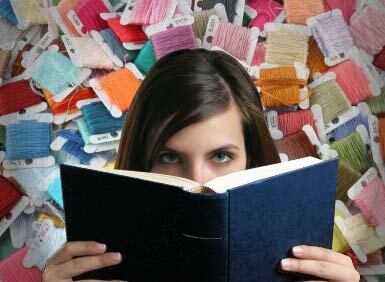 *Cut fabrics of different textures, patterns, and colors into 3”, 4”, or 5” squares. Sew six squares of the sme size together to form a cube, then stuff. These make wonderful, tactile soft blocks for babies and toddlers. P.S. 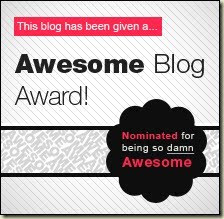 : For those of you who didn't win this week, be sure to stop back next week and post a comment. Lois will be back with on New Year's Eve for Part 2 of our conversation. Merry Christmas from all of us at Killer Crafts & Crafty Killers! Thanks, Anastasia. Personally, I have a feeling I was invited to fill these two slots because today is Christmas Eve, and next week is New Year’s Eve. How many people are out there reading blogs today? Or will be next week? No matter. 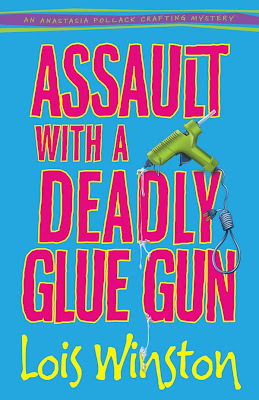 I’m happy to tell you all about ASSAULT WITH A DEADLY GLUE GUN, the first book in the Anastasia Pollack Crafting Mysteries. Here’s where I get to spill some of Anastasia’s secrets. Don’t say anything we might regret! Not to worry. We both want everyone to buy the book, so I won’t be spilling the beans, merely dropping a few appetizers to whet everyone’s appetite. What’s with all the food metaphors? I think you’ve been spending too much time with Cloris. Thanks for reminding me. I’ve been trying to get that image out of my head ever since you wrote it. Sorry about that. How about if we introduce your readers to your mother-in-law? Good idea! You sure did create a lot of family conflict with that one. Besides, I need all the sympathy I can get. I hate whiners. Always have. So I was doing my damnedest not to become one in spite of the lollapalooza of a quadruple whammy that had broadsided me last week. Not an easy task, given that one of those lollapalooza whammies had barged into my bedroom and was presently hammering her cane against my bathroom door. Some people can’t start the day without a cigarette. Lucille Pollack, Monster-in-Law from the Stygian Swamp, can’t start hers without a sludge load of complaints. As much as I detest cigarettes, I’d much prefer a nicotine-puffing mother- in-law, as long as she came with an occasional kind word and a semi-pleasant disposition. Unfortunately, marriage is a package deal. Husbands come with family. And mine came with a doozie to end all doozies. My mother-in-law is a card-carrying, circa nineteen-thirties communist. When she met me, it was hate at first sight. I bear the name of a dead Russian princess, thanks to my mother’s unsubstantiated Romanov link -- a great- grandmother with the maiden name of Romanoff. With Mama, the connection is more like sixty, not six, degrees of separation, and the links are coated with a thick layer of rust. But that’s never stopped Mama from bragging about our royal ancestry, and it set the tone for my relationship -- or lack of it -- with my mother-in-law from Day One. I suppose I didn’t help the situation by naming one of my sons Nicholas and the other Alexander, even if they were named after my grandfathers -- Alexander Periwinkle and Nicholas Sudberry. Why don’t you tell everyone about the blog tour you’ve set up to promote me and the book about me? I do have them occasionally. In addition, I’m also giving away a collection of crafts books at several of the blogs. So look for those as well. And to any of the Killer Crafts & Crafty Killers readers I'm also giving away an assortment of crafts books to one person who posts a comment this week. So let's hear from you, and be sure to check back on Sunday to see if you're the winner. Thanks for having me here today, Anastasia. And Merry Christmas, everyone! Erica, Nichole, and Serena are all off doing last minute Christmas shopping and have dumped today’s blog post in my lap. So let’s discuss gift wrapping. We all want our gifts to look beautiful under the tree, but with the price of gift wrap and ribbon, you can wind up spending almost as much on the packaging of the gift as the gift itself. Or maybe cost isn’t an issue for you (lucky you! ), but you didn’t plan well and now have more gifts than you have wrappings for them, and the thought of one more trip to the store is giving you a panic attack. Whichever category you fit into, here are some suggestions for creative, easy-to-do gift wrapping from various items you have sitting around the house. 2. An old sheet or T-shirt you were going to assign to the rag pile. Just make sure to launder it first! To decorate these packages, print out holiday motifs on your computer, and glue them to the top of the package. Or recycle the fronts of Christmas cards. Or attach a Christmas ornament. If you have craft supplies at your disposal, glue some pompoms to the top of the package to form a flower, Christmas tree, snowman, or other cute design. Use craft gemstones or buttons. Do you have any creative ways you wrap presents? Or manage all those last-minute holiday tasks? Let's hear from you. Post a comment to be entered into the drawing for a special surprise from our Book Club Friday guest author. Thanks, Anastasia! There never seems to be enough hours in the day normally, but come the holidays, life gets even more stressed and complicated for working moms. So take a deep breath and see if any of these last minute time savers will help you out. 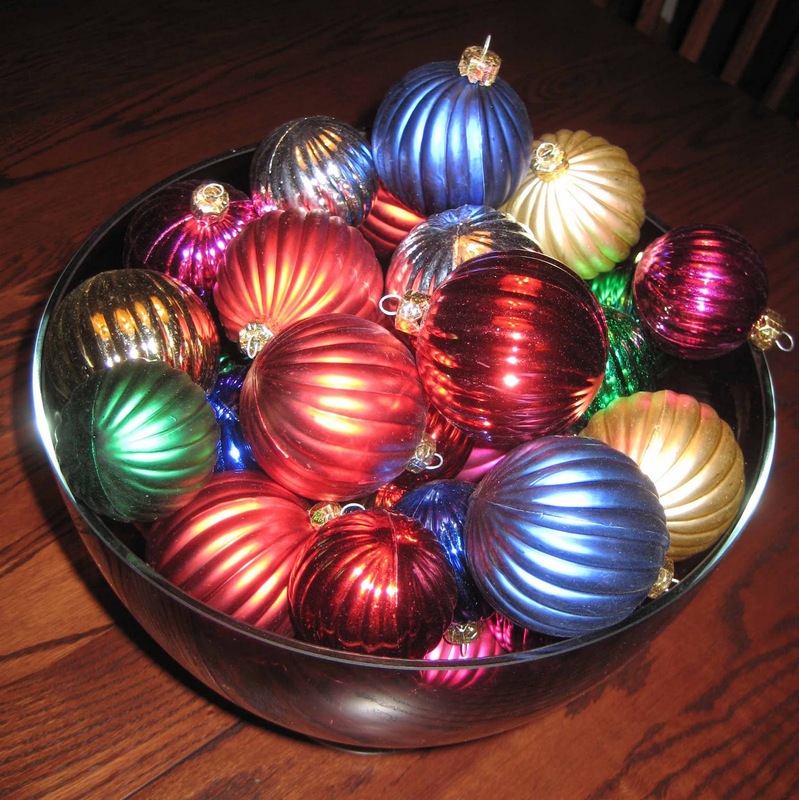 Still don’t have a centerpiece for your Christmas dinner? If you’re lucky, one of your guests will bring flowers. Meantime, grab a bowl, fill it with glass ornaments, and plop it in the center of your table. Still need to finish decorating the house for those guests who will be arriving? As we say in New Jersey, fuhgeddaboudit! So you won’t win the Martha Stewart Award this Christmas. No one is going to care if you didn’t go whole hog in every room. Put out the Christmas hand towels in the powder room, hang a wreath on the door, and be done with it. You’ve got the tree up and gifts around it. People will understand if you didn’t have time to do more. And if your sister-in-law makes some snide remarks about the meager decorating? In your most Christmasy cheerful voice, tell her to…well, you get the idea. I don’t need to spell it out. Same goes for cleaning. You don’t need to scrub your home from top to bottom. Swipe a dust cloth over the coffee and end tables, run the vacuum, scoop up the clutter, and throw some clean sheets on the guest beds if you’re having overnight guests. If you see your mother-in-law donning a pair of white gloves to score you on a Suzy Homemaker test, hand her a Swiffer sheet and tell her you’d love for her to finish cleaning while you finish preparing dinner. When it comes to meals, don’t be guilted into making everything from scratch. Scratch takes hours. Go for heat-and-serve. Head to the bakery for cookies, pies, and other desserts. If anyone complains, ask them if they’re volunteering to do Christmas next year at their home. Finally, pour yourself a glass of wine, put your feet up, and enjoy the holidays. You deserve it. Cream butter and sugars. Beat in eggs and vanilla. Combine flour, baking soda, baking powder, and salt. Add gradually to butter/sugar mixture. Fold in chips. Drop by heaping teaspoonfuls onto greased cookie sheets. Bake in 350 degree oven 10-12 minutes. Cool slightly before removing from cookie sheets. Hot snowflakes? 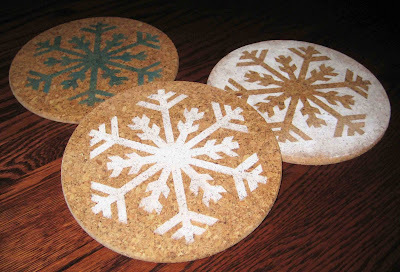 Oxymorons aside, that’s what you’ll have when you stencil snowflakes onto cork trivets. And this craft is so quick and easy that you can whip up a few in no time for that spur-of-the-moment holiday get-together. 1. 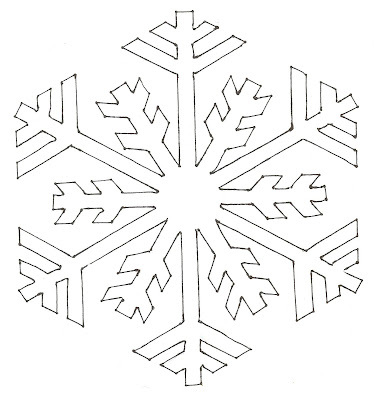 Enlarge the snowflake pattern to 6”. Tape to underside of plastic stencil sheet. Using permanent ink marker, trace pattern onto stencil sheet. 2. Carefully cut out snowflake. If you make a mistake while cutting, you can repair the stencil plastic with tape and recut. 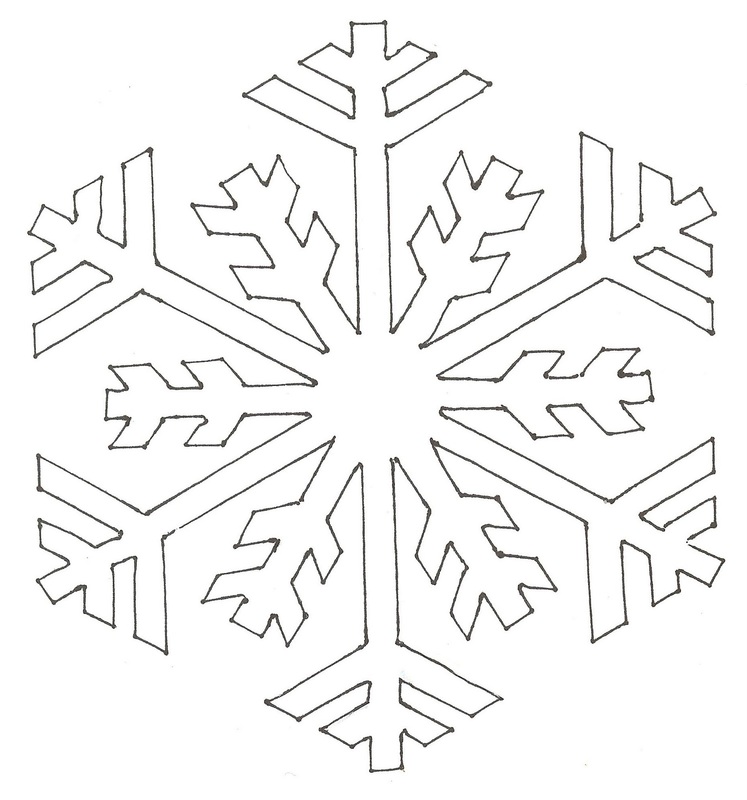 When you’re finished you’ll have two stencils, one a positive image of the snowflake and one a negative image. 3. Apply repositionable adhesive to the back of the stencils. Allow to dry. 4. Place stencil centered over cork trivet. 5. To stencil, dip the tip of the stencil brush into the stencil paint. Remove excess paint by tapping the brush onto a folded paper towel. Hold the brush perpendicular to the stencil and dab the brush in an up and down motion over the cutout edges of the negative snowflake stencil and around the cut edges of the positive snowflake stencil. 6. When stenciling is complete, carefully lift the stencil from cork. Allow the paint to dry 24 hours. 7. Spray surface of stenciled cork with two coats of clear satin acrylic. Tie together a set of two, one positive image and one negative image, with natural raffia to give as a hostess gift whenever you’re invited for dinner or to a party throughout the winter. Everyone always needs a couple of extra trivets, right? Thanks to all who stopped by this week at Killer Crafts & Crafty Killers. We hope you'll come back often and also tell your friends about us. We have lots of exciting posts and guests planned for the months ahead. 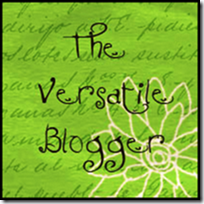 This week we had two giveaways from our guest bloggers. I'd like to thank K.M. Fawcett for offering one of her safety whistles to one of our readers. The winner of the safety whistle is Kathleen Ernst. 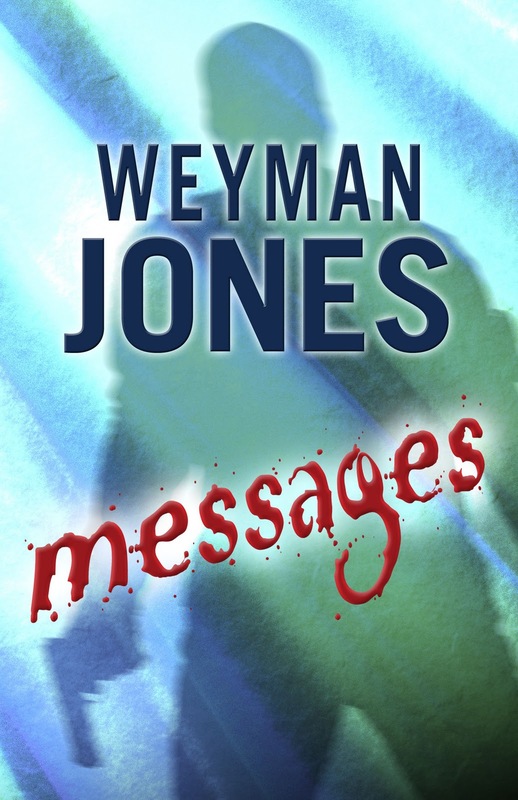 I’d also like to thank Weyman Jones for being our Book Club Friday guest and offering a copy of MESSAGES to one of our readers who posted a comment this week. The winner of MESSAGES is Caridad Pineiro. Our Book Club Friday guest today is Weyman Jones. Weyman began his writing career with magazine fiction, then published three books for young readers. His historical novel for pre-teens, THE EDGE OF TWO WORLDS, earned him both the Lewis Carroll Shelf and the Western Heritage Awards. 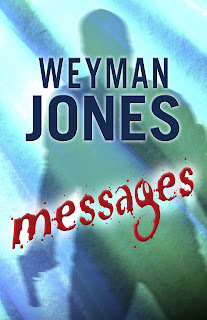 His latest book is MESSAGES, his fourth adult mystery/suspense novel. Early reviews describe it as a "great thriller filled with action and misdirection." Read more about Weyman at his website: www.weymanjones.com. When I quote that line, heads in the audience – usually female and often gray -- nod in recognition. What makes the first line of Rebecca so memorable? But it sings. It’s iambic hexameter. Try it out loud: six alternating beats. Back in 1938, I’m sure Daphne Du Maurier sounded that line in her head before she wrote it. In today’s sound bite and Twitter culture, pop fiction writers labor to produce openers that grab a reader and keep her turning pages. Most of us don’t try to make an opener that sings. The writers’ conference wisdom is that the opening lines should embody a mini-conflict, the tension that leads to the major conflict. Shortly after the death of the failed Quaker, Steadfast Haynes, the Central Intelligence Agency received a telephoned blackmail threat that was so carefully veiled and politely murmured that it could have been misinterpreted as the work of some harmless crank. But it wasn’t misinterpreted. Provocative opening sentence: a deceased, failed Quaker named Steadfast, the CIA and a polite blackmail threat. Suppose you should be walking down Broadway after dinner. . . You turn to look into the thrilling eyes of a beautiful woman. . . She thrusts hurriedly into your hand an extremely hot buttered roll, flashes out a tiny pair of scissors, snips off the second button of your overcoat, meaningfully ejaculates the one word, ‘parallelogram!’ and swiftly flies down a cross street, looking back fearfully over her shoulder. That would be pure adventure. Would you accept it? Of course she didn’t believe in premonitions. What was that prickle down the back of her neck as she pulled into the driveway of her condo? It reminded her that the security director had told her to vary her commuting route every day. She’d told him that would require so much concentration that she wouldn’t be able to enjoy her recorded books in the car. We get a whiff of disaster awaiting an independent woman who marches to her own drummer and a sense of the conflict that drives the narrative: an animal rights organization threatening corporate executives. All in less than a hundred words, about a third of a page. What’s about to happen sets the story in motion, but that’s not what the story is about. Messages is the story of a young man’s search for the truth that will vindicate his mother who has been convicted of the murder of her lover. The animal rights issue provides context and motive for the murders. I hope you’ll find Mike Lyons a man fit for adventure. 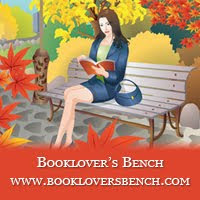 Hi Anastasia, thank you for inviting me to stop by the blog. During my last visit, I spent time reflecting on life, but this time around, I want to take your readers on an incredible international shopping trip. (After all, I promised them I would.) Today we’ll visit Bangkok, Seoul and Singapore in search of the perfect gift. Next time, who knows? Maybe Paris. Or Zurich. Only time will tell. Wow, can you believe it? 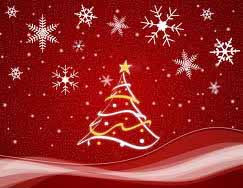 Less than a week to go before Christmas—and I still have gifts to buy! If you’re like me, you may be stumped searching for the perfect gift. Never fear. This year, I have the solution. Come with me, and I’ll show you some of the best deals on the planet: one-of-a-kind gifts that are sure to please. That is, assuming you have a few thousand extra frequent flier miles lying around. Pack lightly, carry-on only, because we don’t want to waste time hanging out in baggage claim. Wear comfy shoes, fill one bag with a few changes of clothing and grab an empty duffel bag for all the great gifts you’ll find. Oh, and dress in layers, ‘cause we’re going through several time zones and climate changes. Ready? We’re boarding a plane that heads up toward Alaska, cuts across the arctic circle and brings us down into exotic Bangkok. By the time we land, you’ll be ready to peel an outer layer off—the Thai natives may think it’s chilly when the thermometer dips into the 70’s but that’s warm to you—right? After somewhere between 16-24 hours in travel mode, I’m sure you’re tired and a little achy, so the first stop is just for you. We’re going to splurge on a Thai massage. When darkness falls, the magic of the night markets lights up. We’ll gab a bicycle cab and head out. In a bustling section of town you find a cluster of vendor stalls—some under roof and others under the stars—all filled with goods to indulge your senses. Crafts. Incense. Massage oils. Perfumes. Silks. My favorites are the lovely silk scarves in rainbow colors. At only a few dollars each, you can pick up enough to share with all your friends. You can also find great silk jackets and other clothing items, all carefully tailored. (Just remember, a Thai “large” may well be an American “small.”) Other wonderful gifts include the colorful ceramic mugs, teapots and dishes whose intricate designs will delight the eye. Why not pick up a covered tea mug and some local tea leaves to brew in it when you get home? Pack your treasures and get ready to hop on a plane again. (Remember the empty duffel bag? We’re starting to fill it up.) We’ll head north to Seoul. The mere 6-8 hour flight seems short after the trip to Thailand, doesn’t it? Still, I bet you’re hungry by now. Pile on an extra layer of clothing (we’re back in the cold north) and we’ll get some traditional Korean food. Not sure about that? Trust me. Korean barbeque is thin sliced, seasoned cuts of beef grilled at your table top with onions and vegetables. Yum! The only trick is using the slippery, pointy stainless steel chopsticks (forks are hard to find). Fill up because we’re off to the shopping areas. The national stone of Korea is amethyst. At stores throughout Seoul, you can find hundreds of the gem stones for sale at affordable prices. Here’s your chance to get a truly impressive gift for someone special. I admit, I also fell in love with the shoes! And boots! I found a lovely pair of knee-high leather boots and a pair of gorgeous green suede ankle boots. Who said all of the shopping had to be for someone else? OK. One more plane trip and one last stop. We’re going back south to Singapore. (Slip on your shorts and put the heavy clothing away!) We won’t do a lot of shopping here—Singapore malls and prices are similar to upscale American versions. Instead, we’re here to indulge in one last, rejuvenating experience. We’re going to the fish spa. Yes, you heard me. Fish spa. After washing and thoroughly rinsing your feet and legs, sit on the raised benchs and dangle your legs in the fish tanks at your feet. A special breed of fish then nibble away your dry skin and calluses while a spa technician give you a neck and shoulder rub. As you relax, you realize the fish are giving your legs a tiny, tingling massage—not at all uncomfortable. And when you get out your skin is smooth and soft. Now that you’re refreshed, it’s time to get on one last plane and head home. If you’re lucky—and we’ve been lucky this trip, haven’t we?—you’ll get upgraded to first class where you can curl up on a seat that converts to a bed and dream away the hours till landing time. Get some rest. Once you land, you’ll only have a few hours to wrap those gifs and put them under the tree! Like Santa, you’ll have made your way around the world to bring the perfect gifts home to the ones you love. Today we welcome back safety expert K.M. Fawcett with a tip on how to blow the whistle on the bad guy. What is the one thing that an attacker doesn’t want? Attention. So why not keep a safety whistle with you? If someone is getting too close for comfort in the parking lot or you feel you are in danger, blow your safety whistle. Heads will turn. Maybe even more effectively than yelling “fire.” Let’s face it, humans are curious and a whistle blow will garner quick attention. 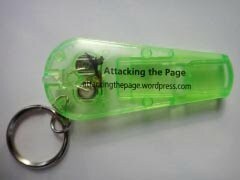 It may also scare off an attacker who is looking for an easy target. A safety whistle is also a great thing to bring with you when camping, hiking, biking, or exercising anywhere outdoors. If you get lost or injured, blowing your safety whistle will let others know you need assistance. It requires less energy to blow a whistle than to yell. Therefore, it won’t exhaust you or make you lose your voice like yelling does. A whistle can also be heard longer distances than your voice. Cream butter, gradually adding sugar until mixture is light and fluffy. Stir in flour until well blended. Cover with wax paper and chill for several hours. Work with half the dough at a time, keeping remainder chilled. Roll dough out to 1/2” thickness on floured surface and cut out with desired cookie cutters. Place on ungreased cookie sheets 1” apart. Decorate with Christmas sprinkles if desired. Bake in 300 degree oven for 30 minutes or until cookies turn light brown around the edges. Cool slightly before removing from cookie sheets. Optional baking idea: Use a stoneware shortbread cookie mold or pat dough into 9” round cake pans and cut into wedges. The best part of shortbread? It gets better with age. So make it a few days ahead of time.